1. The “F*ck You, Audience” Award goes to … The Mist. Thomas Jane, twice-baked Punisher and Bane of Sharks, cannot register to the Greatest Wrong Way in the History of Moviemaking. I am Number 6 of the 39 Shamelessly Perverse Cinemaphiles who Rose and Hollered Approval at the conclusion of this MAW-sterpiece. We get together once a month at the Starbucks in Middletown to yuk it up. 2. Dirk and the Cylon – “Faceman” comes face-to-face with a strutting silvery scrap of his late 70s space adventures. While filming an episode of “The A-Team” at Universal Studios, Dirk Benedict spotted the Cylon & insisted on filming a walk-on for the erstwhile antagonist. The moment, cut and pasted into the opening credits, was sometimes more explosively crowd-pleasing than the majority of the episodes of the show’s flimsy final season. G*ddammit, Robert Vaughn, you tainted “Superman III” and “The A-Team”. Must be why he’s doing generic law firm commercials now…”Tell the insurance companies you aren’t going to take it anymore! Call Flair, Blanchard, Anderson and Anderson, Georgia’s toughest law firm!” <—-If anyone gets this reference, mazel tov, you’re a monkee! 3. The Goofy Yell – It always puts you in a better place. 4. The Bizarro Goofy Yell – It always puts you in a better place…but no one believes you. 6. The Iron Grenadiers: Destro Goes Solo – Another resplendent entry into the “Oh, Yeah, That’s RIGHT…!” files. 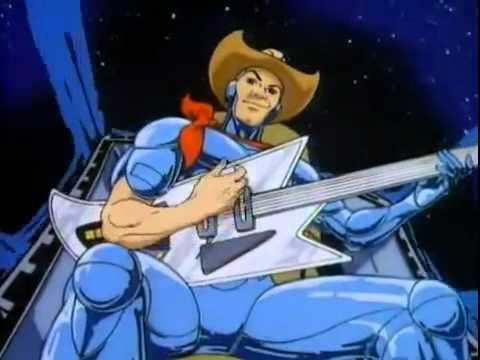 Eventually, Destro tired of interposing himself between the cacophonous conflicts of Cobra Commander and Serpentor, deciding to John Lennon himself into his own band of deadly misfits, the Iron Grenadiers. A great and refreshing twist to the G.I.Joe mythology with one glaringly hideous problem: the animated series presented the Grenadiers as an off-shoot of Cobra. Hey, it was nice for a little bit to chase your own dreams, wasn’t it, Destro?